Team Full Tilt pro Allen Cunningham outlasted one of the toughest fields in the history of the World Series of Poker Circuit events to make the final table at the WSOP-C Caesars Las Vegas Main Event, then came from well back in the pack at the final table to capture the title and the $499,162 first-place prize money. 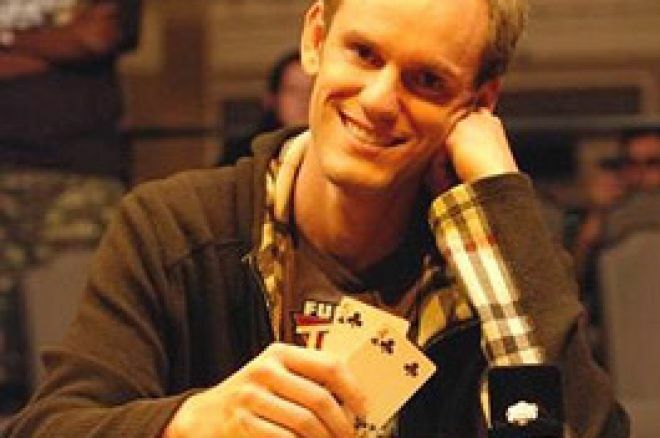 Along the way, superstars such as Erick Lindgren, Chris Ferguson, Alex Kravchenko and Todd Brunson all fell by the wayside, leaving Cunningham holding the championship ring after three days of play at Caesars Palace. Doug Lee's attempt to join Chris Ferguson and Peter Feldman as the only multiple Circuit Main Event winners fell short when he busted in ninth place. After losing a huge pot to Motoyuki Mabuchi moments before, Lee put the last of his chips in preflop with and found one caller in Ben Fineman with . The flop hit both men, coming down , but the turn gave Fineman the lead with the . The on the river gave Fineman a K-high straight, and sent Lee home in ninth place ($32,204). No jack appeared, and Perry was busted in eighth place as Cunningham moved into the land of the big stacks. Thomas Hover moved all in preflop with after Kelly Samson's raise, prompting a call from Samson with . The flop was fairly mundane, coming down , but the turn brought excitement in the form of a flush draw for Hover. The one heart he didn't want to see came on the river, as the gave Samson a full house to trump Hover's flush, and he was eliminated in seventh place. The 60-year-old Hover picked up $64,408 for his tournament. Online pro Blair Hinkle fell to Ben Fineman in sixth place when he moved over the top of Fineman's preflop raise with , defending from the big blind. Fineman thought for a moment before making the call with , and the flop came down , no help for Hinkle. The on the turn gave Hinkle outs to a straight and a flush, but the river sent him to the cashier's cage to collect $80,510 in prize money. Allen Cunningham claimed the next victim when he sent Justin "ZeeJustin" Bonomo to the rail in fifth place ($96,612). Cunningham moved all in over the top of Bonomo's preflop shove to isolate with , and got heads up against Bonomo's . Bonomo picked up straight outs on the turn as the board read , but the on the river gave Cunningham the pot and Bonomo the boot. Next, in a rare post-flop hand, Fineman moved all in with the board reading , and Motoyuki Mabuchi called with Kh-2h. Fineman tabled for a dominating kicker, and when the turn and river ran out , Mabuchi was busted in fourth place ($112,714). Kelly Samson flirted with the chip lead all day before finally busting in third place ($128,816) at the hands of Ben Fineman. On a flop of , Samson fired at the pot, then called Fineman's raise with for top pair. Samson fired again when the turn gave him trips, and Fineman moved all in. Samson quickly called, only to find himself hoping to pair the board as Fineman revealed for the flush. The came on the river, and Samson went to the rail in third. Fineman took a 3:1 chip lead into heads-up play, but it didn't take long for Cunningham to double through and pull even with the chip leader. On a board of , Cunningham moved all in over the top of Fineman's continuation bet. Fineman called with pocket sevens, but Cunningham was well ahead with for top pair. The turn and river came down , and Cunningham doubled through Fineman to pull near even in chips. Over the next 30 minutes, Cunningham slowly took over the chip lead until finally both players picked up big hands and got all the chips in the middle. In that hand, Fineman raised preflop with , and Cunningham called from the big blind with . The flop came down , and both players checked. Cunningham fired when the on the turn made his flush, and Fineman put in a stiff raise with his Broadway straight. Cunningham moved all in, and Fineman made the call, only to find himself drawing dead. The irrelevant completed the action, and Allen Cunningham busted Ben Fineman (2nd, $257,637) to claim his first WSOP-Circuit ring and the $499,162 first-place prize money.